NEW YORK (CNNMoney) -- U.S. stocks closed higher for a fourth consecutive day Thursday as bank stocks led the market higher following a coordinated effort by five central banks to help ward off a credit crisis in Europe. The European Central Bank, the U.S. Federal Reserve and three other major central banks agreed to step in to boost dollar liquidity for banks in Europe. The move comes amid signs of a pullback in bank-to-bank lending as European Union officials struggle to resolve long-standing sovereign debt issues. Shares of French, German and Spanish banks all rallied, with gains spilling over to U.S. banks. Goldman Sachs (GS, Fortune 500), Bank of America (BAC, Fortune 500), JP Morgan Chase (JPM, Fortune 500) and Citigroup (C, Fortune 500) all shot up more than 1.5% on the news. 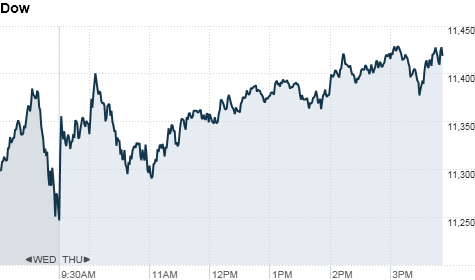 The Dow Jones industrial average (INDU) rose 186 points, or 1.6%, to 11,433. The S&P 500 (SPX) added 20 points, or 1.7%, to 1,209. The Nasdaq (COMP) ticked up 34 points, or 1.3%, to 2,607. While the markets cheered the central banks' move, investors were still cautious about the long-term outlook for Europe's debt crisis. "It's good news in the short term, but as long as the central banks are jumping through hoops to alleviate market pressures, it provides less incentive for governments to reform," said Jack Ablin, chief investment officer with Harris Private Bank. "It's not a long-term solution and ultimately forestalls real reform." Despite jitters about Europe, stocks have posted gains each day this week. That rally was helped along on Wednesday, when German Chancellor Angela Merkel and French President Nicolas Sarkozy insisted that Greece would remain a eurozone member and would achieve its fiscal targets. Paul Zemksy, head of asset allocation at ING Investment Management, said the market could test the highs it hit at the end of August. "But I don't think we'll go much higher than that," he added. "We've still got a pretty soggy economy." Economic data released Thursday underscored the mixed outlook for the United States, where a lack of business and consumer confidence has weighed on growth. Economy: The government's weekly report on initial claims for jobless benefits came in higher than expected, with claims rising to 428,000 in the latest week from 414,000 the previous week. Economists had expected a modest decline. Meanwhile, the Federal Reserve Bank of New York's Empire State Manufacturing Survey worsened to -8.9 in September, from -7.7 in August. Another reading on regional manufacturing, the Philadelphia Fed index, showed manufacturing activity slowed in the mid-Atlantic area in September, although less than expected. The U.S. Consumer Price Index showed prices rose at an annual rate of 3.8% in August -- the highest annual increase since 2008. Companies: UBS (UBS) shares traded in the U.S. plunged 11%, after the Swiss bank said unauthorized trading resulted in about $2 billion in losses. While UBS said no client positions were affected by the loss, the investment bank cautioned that it could report a third-quarter loss as a result. Shares of Morgan Stanley (MS, Fortune 500) rose over 7% after the investment bank said John Mack will step down as chairman at the end of the year. Netflix (NFLX) shares fell 15.8%, after the video rental company reduced its forecast for third-quarter subscriptions in the United States. World markets: In Europe's afternoon trading, Britain's FTSE 100 (UKX) gained 2.1%, the DAX (DAX) in Germany added 3.2% and France's CAC 40 (CAC40) rose 3.2%. Asian markets ended mixed. The Shanghai Composite (SHCOMP) fell 0.2%, while the Hang Seng (HSI) in Hong Kong added 0.7% and Japan's Nikkei (N225) gained 1.8%. Currencies and commodities: The dollar fell against the euro and the British pound and the Japanese yen. Oil for October delivery gained 49 cents to settle at $89.40 a barrel. Gold futures for December delivery fell $45.10 to close at $1,781.40 an ounce. Bonds: The price on the benchmark 10-year U.S. Treasury fell, pushing the yield up to 2.08% from 2% late Wednesday.